Republican Party lose on government shutdown and debt limit: The GOP rewrites their defeat. Republicans are wasting no time in rewriting the history of their own defeat. House Speaker John Boehner (R-Ohio) speaks to reporters after a Republican caucus meeting at the U.S. Capitol in Washington on Oct. 15, 2013. For the men and women of the U.S. Senate, Wednesday morning was a time of jubilation. Hark—a deal was born! Sens. Harry Reid and Mitch McConnell came bearing a bipartisan agreement that punted the debt and government funding deadlines with a minimal amount of riders. “Political adversaries set aside their differences and disagreement,” said Majority Leader Reid. “I think we have the framework for the kind of bipartisanship that the American people need and want,” said Sen. John McCain. The Arizona senator, who’d logged hours of TV interviews blaming the House Republicans for the shutdown, was closing the book on the whole mess. At the same time, far away from the sound of handshakes and backslaps, the House Oversight Committee was conducting an investigation into the real culprit of the shutdown. Jonathan Jarvis, director of the National Park Service, had been subpoenaed in an investigation of why beloved open-air parks and memorials—the World War II Memorial, especially—were barricaded during the shutdown. Why, asked Rep. Darrell Issa, did an anonymous park ranger tell the Washington Times that the feds would make the shutdown “as difficult as possible”? Why did parks stay open for Occupy Wall Street but closed to the men who stormed Omaha Beach? “You came before one of our committees and made it clear that you were going to reinterpret the First Amendment to include basically people sleeping in the parks, defecating on the lawns, creating a health hazard for the people of the District of Columbia,” said Issa. Within hours, Gowdy and Issa would join their fellow House Republicans for a short meeting. 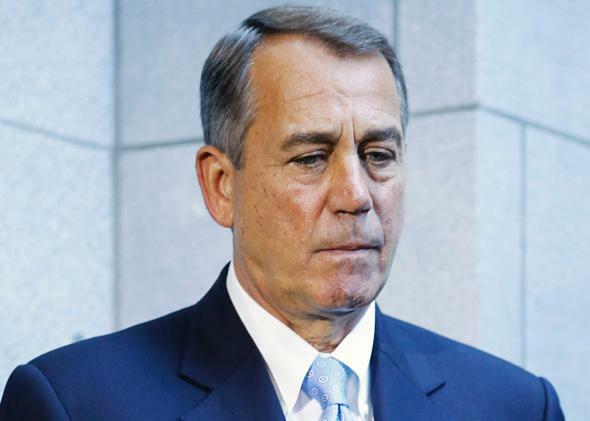 House Speaker John Boehner would admit defeat. But some Republicans were declaring a victory of sorts—maybe not now, but down the road—for what the media had already judged to be a historic debacle. They had revealed President Obama to be a cynical political operator. They had proved to voters that they did everything they could to stop Obamacare. When the next spending fight comes around, they insisted that enduring this shutdown would strengthen their position. Human beings have been putting their best spin on defeats since the invention of “winning” and “losing.” Obviously, the many Republicans who don’t want to trash their colleagues on the record are going to look for the Alamo underneath the rubble of this loss. But this shutdown had meant a lot to the party. Only a few dozen current members of the GOP conference had endured the last shutdown in 1995–1996. Those who hadn’t—and some of those who had—have insisted for years that it was not truly a defeat for the party. In his 1998 memoir, Newt Gingrich blamed the media for making that shutdown a “story of Republican heartlessness.” By 2010, when he reminisced about the shutdown, Gingrich argued that its real lesson was that his GOP had held onto the House in 1996 and balanced the budget—and that if the GOP shut down the government to stop Obamacare, the country would rally to the cause. Salmon was one of a half-dozen conservatives who met to talk this over at an on-the-record Wednesday panel sponsored by the Heritage Foundation. As the audience chowed on Chick-fil-A, conservatives denounced any suggestion that the party had been weakened by the shutdown. Idaho Rep. Raul Labrador’s main quibble with the party’s strategy—apart from all the weak-kneed members trashing their colleagues—was that it didn’t raise the debt limit while continuing to debate the continuing resolution, a ploy that would have lengthened the shutdown. Even outside the Chick-fil-A chamber, Republicans were full of reasons why the shutdown hadn’t hurt. Arizona Rep. David Schweikert tore into one reporter’s question about the “polls” showing the GOP’s reputation falling. “Did you look at the samples?” asked Schweikert. After the reporter slumped away, Schweikert told me that the media’s polls missed the target. 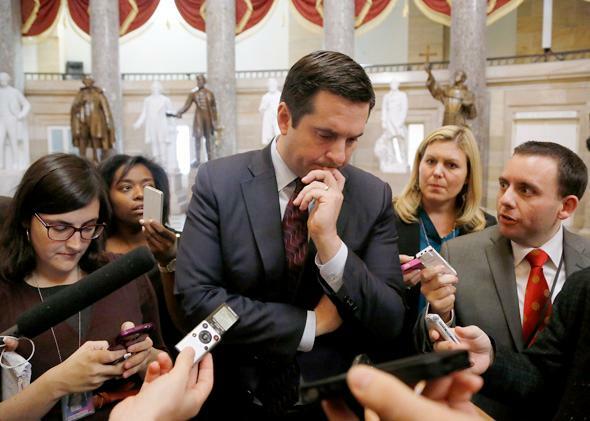 Rep. Devin Nunes (R-Calif.) talks to reporters at the U.S. Capitol in Washington on Oct. 15, 2013. Does this mean that Republicans would enter into another shutdown standoff with no fear? That’s not how they look at it. They view any attempt to blame them for the shutdown, and not the president, as media bias in concentrate. This shutdown proved them right, and they’ll carry that knowledge into the budget battle.